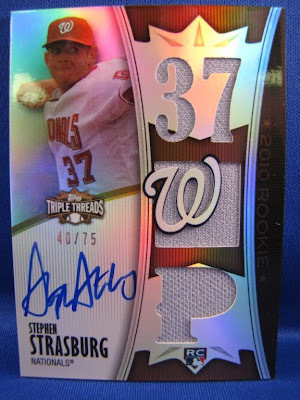 Yesterday, Topps threw up a blog on Stephen Strasburg cards. He's the hottest thing the company has going right now and they are going to milk him for everything he is worth. First of note, there are 500 autographs in Topps Tribute . That's the print run. It's great to know they are releasing that info because some companies do not. What was most interesting on the blog, though, were the photos of some of the Triple Threads cards of Strasburg. I actually like these cards. They look different than Triple threads in the past, which has been OK, but still sold because many collectors enjoyed the uniqueness of the cards. Triple Threads has not been very pretty in year's past, however, I feel these cards are a step in the right direction. I love the cutout of the team logo as well. More cutouts that make sense and less HR440BB because it often takes me a while to understand what the cards mean. On-card autos. See how much on-card autos makes everything look nicer. When I read Beckett's post, I was qutie ecstatic about on card autos as well. Really enhances the product. Those cards almost have the original Topps Tribute look going for them with the on card autos.